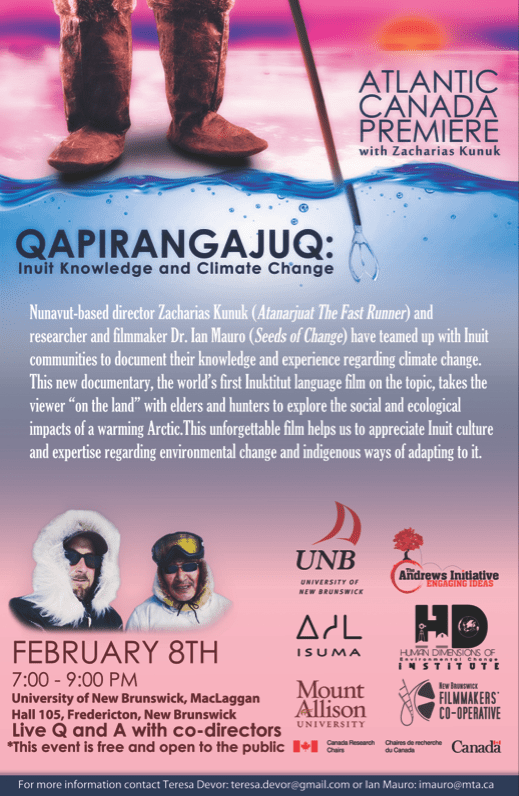 It was an honour to host Zacharias Kunuk and Ian Mauro at the University of New Brunswick in Fredericton for a screening of Qapirangajuq: Inuit knowledge and Climate Change last February. Although the planning period – little over a month – was short, the event seemed to have a life of its own, and support for it snowballed like a winter-sculptor’s dream. My colleague, Erin Morton, was enthused to get involved in the organizing. We received generous support from departmental staff at UNB and St. Thomas University (we share a campus), the Maliseet Women’s Drum Group was excited to play, and the St. Thomas Students for Sustainability had a bake sale to contribute to the fundraising! Qapirangajuq, the first Inuktitut-language film on the subject of climate change, is a communique from the North, a way for the people of Nunavut, at the Arctic heart of the world, to share the meaning and implications of climate change for their lives. As Kunuk put it before the film was screened, it is the Inuit putting their two cents in, because so many scientists and corporations are not asking them for their observations, experiences, and knowledge. Qapirangajuq explores the changes that Inuit have observed in the ice, waters, animals, and skies of their homeland. From the increasing impossibility of predicting the weather based on traditional knowledge, to the way that Inuit education, values and law continue to provide strategies for living in the North, the film is a new approach to dialogues about climate change. It is an injection of reality to a conversation that is commonly limited by scientific uncertainties and media sound-biting, which often leave the mind with nothing on which to chew. 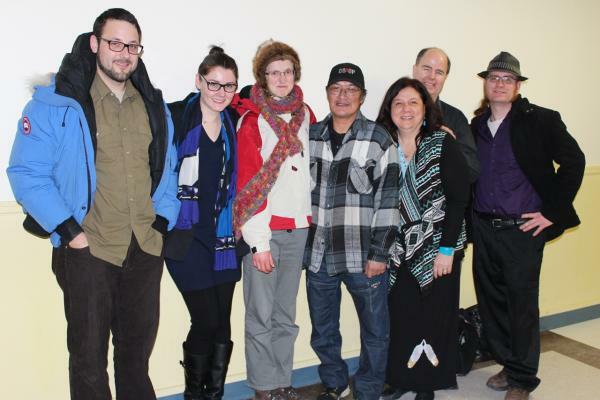 Qapirangajuq: Inuit knowledge and Climate Change, can be screened on the website of Isuma Productions. See it for yourself: http://www.isuma.tv/isuma-productions . Teresa Devor is a PhD candidate at the University of New Brunswick.